Great Music at St. Bart’s, the concert series produced by the Mid-Manhattan Performing Arts Foundation (MMPAF), for the past seven years has presented music in St. Bartholomew’s Church, a parish of the Episcopal Diocese of New York located in the heart of midtown Manhattan. 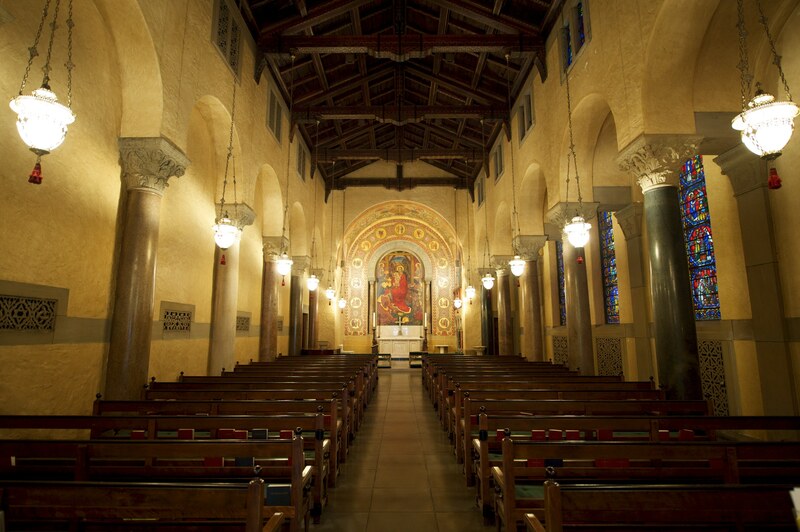 The magnificent 1918 Romanesque-style church features a portal designed by Stanford White and a grand Byzantine-style interior – and two of New York’s unlikely but outstanding concert spaces: the 150-seat chapel, an intimate and acoustically brilliant space that is perfectly suited for contemporary chamber music, and the majestic 1,000-seat sanctuary – outfitted with comfortable chairs enabling flexible seating – whose Aeolian-Skinner pipe organ is the largest in New York City and one of the finest examples of the American Classic Organ in the U.S. The 10 events of the 2017-18 season of Great Music at St. Bart’s continue the programmatic focus initiated by MMPAF Artistic Director William K. Trafka (Director of Music and Organist of St. Bart’s): to embrace a wide range of music in programs that shine in St. Bart’s spaces. Events in St. Bart’s Chapel launch with the season-opening event presented in conjunction with Gotham Early Music Scene and Amherst Early Music’s CityRecorder workshop: a performance by the young recorder phenomenon Martin Bernstein. The maverick new-music ensemble Hotel Elefant performs music by Kaija Saariaho and New York premieres of new works by Hotel Elefant composers Hannis Brown, Patrick Castillo, Jascha Narveson, Leaha Maria Villarreal, and Kirsten Volness. The acclaimed pianist Marilyn Nonken and cellist Stephen Marotto perform Morton Feldman’s 1981 Patterns in a Chromatic Field, one of the composer’s most intricate chamber works. In addition, the Apple Hill String Quartet makes a return to the series, and the Dorian Wind Quintet performs an evening of jazz; music by George Gershwin, Gunther Schuller, and Lalo Schifrin. William K. Trafka has been the Director of Music and Organist of St. Bartholomew’s Church since 1995. Prior to that, he served as St. Bartholomew’s Associate Organist for 10 years. He leads St. Bartholomew’s Choir and St. Bart’s Singers and is the Artistic Director of the Mid-Manhattan performing Arts Foundation, overseeing the programming of Great Music at St. Bart’s. He also programs and conducts St. Bartholomew’s annual Summer Festival of Sacred Music. At St. Bart’s, he has conducted the premieres of several works including David Conte’s September Sun and Missa Brevis, James MacMillan’s Since it was the day of preparation (New York premiere), and Herbert Howells’ Hymnus Paradisi (New York premiere of the orchestral version) as well as works by Ēriks Ešenvalds and Neely Bruce. As an organist, he has performed on concert series throughout the U.S. and Germany and has also performed with the New York Philharmonic, the American Symphony Orchestra, and the Fairfield Academy of Period Instruments. He has also served on the faculty of Westminster Choir College in Princeton, New Jersey, as Adjunct Professor of Sacred Music. Great Music at St. Bart’s is produced by the Mid-Manhattan Performing Arts Foundation, an independent 501(c)(3) corporation established to cultivate, promote, sponsor and develop the understanding and love of the performing arts as presented at St. Bartholomew’s Church. The corporation sponsors performances of music, dance, drama, and other performing arts as well as the exhibition of works in the film and fine arts genres. St. Bartholomew’s Church was founded in January 1835. Its present building, a Byzantine style structure with an iconic dome, designed by Bertram Goodhue and completed in 1918, has had a vital presence in New York for close to a century. St. Bartholomew’s also became a force in the musical life of the city and the wider church: Legendary musicians such as Leopold Stokowski, who went on to a career as one of the world’s great conductors, Harold Friedell and James Litton have served the church as Organist and Choirmaster. For many decades, a world famous weekly series of Evensongs featuring performances of the great oratorios by St. Bartholomew’s Choir was offered free of charge, stressing the parish’s commitment to inclusion by ministering to a wide community. Great Music at St. Bart’s, an outgrowth of these Evensongs, still offers the greater New York City community top shelf concert performances at very reasonable ticket prices. The Mid-Manhattan Performing Arts Foundation in conjunction with Gotham Early Music Scene and Amherst Early Music’s CityRecorder workshop present the young recorder phenomenon Martin Bernstein, with Elliott Figg, harpsichord, in a program of 17th century music and poetry in the intimacy of St. Bartholomew’s Chapel. The program will include love songs of Giulio Caccini, shepherd’s laments of Sebastien de Brossard and instrumental works of Nicolas de Grigny and Nicola Matteis. Martin Bernstein is a student of recorder virtuoso Nina Stern. After graduating from Hunter College High School, he studied at the Royal Conservatoire of The Hague with Reine-Marie Verhagen, where he also worked extensively with Han Tol. He is currently a student at Harvard University. Jason Roberts, St. Bartholomew’s Associate Director of Music and Organist, will provide live, improvised accompaniment on St. Bart’s famous Aeolian-Skinner pipe organ to three short comedies of Buster Keaton. Convict 13 (1920) features Keaton as a golfer who is mistaken for a convict. In The Boat (1921), Buster and his family sail into the Pacific Ocean in a homemade vessel that is barely seaworthy. And in Day Dreams (1922), Buster tries to win the hand of his girl by “making it big” in the city. Over the past three years, Jason Roberts has improvised the organ accompaniment to St. Bart’s screenings of The Wind starring Lillian Gish and the Buster Keaton classics Steamboat Bill, Jr., and The General. 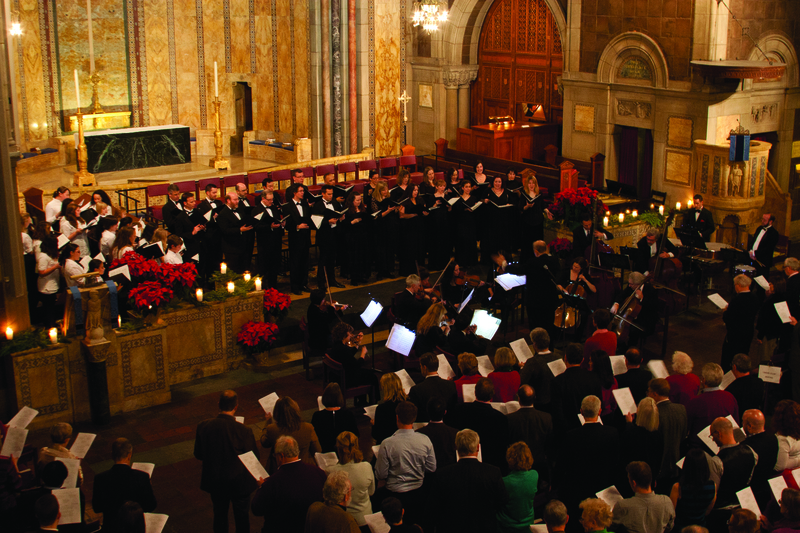 A beloved New York holiday tradition, this concert combines the choral forces of St. Bart’s, New York City’s largest pipe organ, and a chamber orchestra for a concert of Christmas favorites. The Christmas portion of Handel’s Messiah, Vaughan Williams’s Fantasia on Christmas Carols and carol settings of Ešenvalds, Chilcott, Willcocks and others are performed in the candlelit splendor of St. Bartholomew’s Church. Singer Jeff Morrissey and St. Bart’s Music Director William Trafka present their popular Christmas program inspired by the elegant paintings found in the South Chapel of St. Bartholomew’s. In 1919 Ethel Parsons Paullin and her husband Telford created the beautiful Adoration of the Magi and the 13 medallions surrounding it depicting subjects connected with the Nativity of Christ. This program brings the artwork to life, weaving passages from the Bible with Polish carols and ballads from the Southern Appalachian Mountains as well as works by Nin, Ramirez, Grainger, and Michael Head to present a visual and musical telling of the Christmas story. 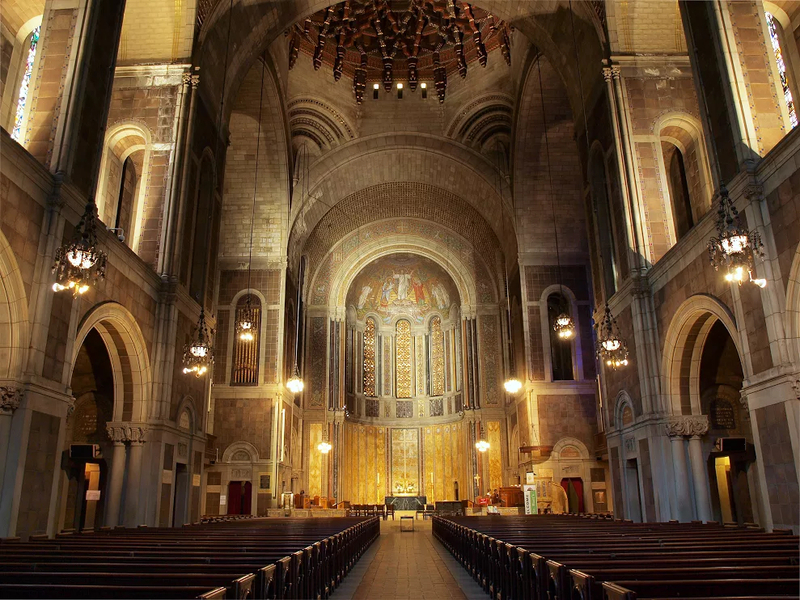 In an annual St. Bart’s tradition, William Trafka, Director of Music and Organist, performs works by Bach, Guilmant, and Mendelssohn on St. Bartholomew’s grand Aeolian-Skinner pipe organ, one of New York’s greatest musical treasures. Trafka’s own transcription of Copland’s Fanfare for the Common Man will be played at the stroke of midnight. A free champagne reception will follow the concert. The contemporary music ensemble Hotel Elefant, lauded by Time Out New York as “megatalented” and “one of New York’s fastest rising new-music outfits,” makes its Great Music at St. Bart’s debut. Their program juxtaposes music by Kaija Saariaho (Nocturne, Oi kuu) with the New York premieres of new works by Hotel Elefant composers Hannis Brown, Patrick Castillo, Jascha Narveson, Leaha Maria Villarreal, and Kirsten Volness. Named for the scene of a chance meeting in Austria between Strauss, Mahler, Puccini, and Schoenberg in 1906, Hotel Elefant has achieved renown for celebrating the dynamism and diversity of the contemporary music landscape, and has appeared at Carnegie Hall, Lincoln Center, the Guggenheim Museum, and the Bang on a Can Marathon. Since its founding in 2007, the Apple Hill String Quartet – Elise Kruder, Colleen Jennings, violin; Mike Kelley, viola; Rupert Thompson, cello – has earned praise around the world for its concerts presenting interpretive mastery of traditional repertoire as well as for new and commissioned works by outstanding composers. As resident musicians at the Apple Hill Center for Chamber Music, the Quartet is featured in the summer concert series at the Center in Nelson, New Hampshire. Apple Hill’s innovative outreach program “Playing for Peace” focuses on social change and conflict resolution through music. Five choral works by Northern European composers offer a testament of faith and a glimpse into a transcendent world: the Requiem of Icelandic composer Jón Leifs (1899-1968), Stars and Only in Sleep of Latvian Eriks Ešenvalds (b. 1977), works by Norwegian Ola Gjeilo (b. 1978) and Swedish Jan Sandström (b. 1964), as well as music of Norwegian Edvard Grieg (1843-1907), all performed in the noble Romanesque architecture of St. Bartholomew’s Church. The Dorian Wind Quintet – Gretchen Pusch, flute; Gerard Reuter, oboe; Benjamin Fingland, clarinet; Adrian Morejon, bassoon; Karl Kramer-Johansen, horn – is known worldwide as one of chamber music’s pre-eminent and longest continuously-active ensembles. They have been responsible for 40 commissions of wind music from major composers; their commission of George Perle’s Wind Quintet No. 4 won the Pulitzer Prize for music in 1986. At St. Bart’s, the quintet will perform a program of jazz works including Gershwin’s Three Preludes, Gunther Schuller’s Blues, Billy Childs’s Fugue in Perpetual Motion, and Lalo Schiffrin’s La Nouvelle Orleans. Marilyn Nonken has been recognized as “a determined protector of important music” (New York Times), and “one of the greatest interpreters of new music” (American Record Guide). Since 2006, she has been Director of Piano Studies at NYU’s Steinhardt School, where she is currently Associate Professor of Music. Boston-based celllist Stephen Marotto, a member of Sound Icon and the Contemporary Sinfonietta, has performed internationally at venues including the Banff Centre, SoundSCAPE (Maccagno, Italy), and the Summer Courses for New Music (Darmstadt, Germany). His wide-ranging musical interests include contemporary chamber music, improvisation, and electronic music, and he has coached with the Arditti and JACK quartets. Tickets are available through the Box Office at St. Bartholomew’s Church, 325 Park Avenue, New York, NY, and are available by phone, 212-378-0248, and online.